Copyright: © 2018 Xia C, et al. This is an open-access article distributed under the terms of the Creative Commons Attribution License, which permits unrestricted use, distribution, and reproduction in any medium, provided the original author and source are credited. ANOVA: One Way Analysis of Variance, BHA: Butylated Hydroxyanisole, DPPH: Di(phenyl)-(2,4,6- trinitrophenyl)iminoazanium, GC-MS: Gas Chromatography- Mass Spectrometry, SC50: 50% Scavenging Concentration, SDE: Simultaneous Distillation Extraction, SFE: Supercritical Carbon Dioxide Extraction, TBHQ: Tertiary Butylhydroquinone. Tea, made from leaves (Camellia sinensis), is one of the three most consumed beverages in the world . There are a number of reports concerning human health benefits of tea leaves and their bioactive compounds, such as anti-bacterial, anti-viral, anti-histaminic, immune function, protective effects against many chronic diseases, and inflammation [2,3]. Recently, flowers of tea (Camellia sinensis) plants have also attracted increasing interest of researchers. This is due to that there are abundant and non-utilized resource of tea flowers, for example over 1.8 billion kilograms of tea flowers are available annually in China . Moreover, many bioactive compounds including catechins, caffeine [5,6], flavonol glycosides , polysaccharides , amino acids , floratheasaponins [10-12], and spermidine derivatives  were identified in tea flowers. Besides these non-volatile metabolites, volatile compounds including fatty acid derived volatiles, volatile phenylpropanoids/ benzenoids, and volatile terpenes in tea flowers have been characterized [14-17]. However, the bioactivity of the essential oil of tea flowers has been rarely studied and reported so far. Occurrences of these volatile compounds in tea flowers provide basis for future application of essential oil of tea flowers in food flavor and cosmetic industries. Therefore, it is important to establish an approach to prepare natural essential oil of tea flowers without organic solvent residue. The essential oil from plants was generally prepared through Simultaneous Distillation Extraction (SDE). SDE is an effective approach to prepare volatile concentrates, but thermal decompositions of volatile compounds, for example, hydrolysis of some glycosidically bound volatile compounds, may easily occur during the extraction process due to the comparatively high temperature of extraction [18,19]. In addition, residue of chemical solvents in the final essential oil product prepared by SDE is unavoidable. Therefore, Supercritical Fluid Extraction (SFE), a technique without use of organic solvents, has been developed and applied to extraction of natural products from vegetable matrices . The non-toxic and volatile fluids, such as carbon dioxide, are used in SFE during the acquirement of several types of substances, so there is no doubt that it will protect extracts against thermal degradation and solvent toxicity . Carbon dioxide is relatively an inert, non-flammable, nonexplosive, inexpensive, odorless, and safe solvent and is easily removed from the extracts . In addition, carbon dioxide has a low surface tension and viscosity but high diffusivity which is one or two orders of magnitude higher than other fluid. The critical condition (31.8°C and 73 atm) of the carbon dioxide makes it attractive for the extraction of heat-sensitive compounds . The aim of this study was to apply SFE to extract natural volatile compounds from tea flowers without thermal degradation and residue of organic solvents. The important parameters such as pressure, temperature, static and dynamic time affecting the SFE of essential oil of tea flowers were optimized. In addition, the Di(phenyl)-(2,4,6- trinitrophenyl)iminoazanium (DPPH) radical scavenging activity of the essential oil of tea flowers was evaluated. The dried tea flowers (moisture content of 100 g kg-1, Camellia sinensis cv Longjing 43) were provided by Kaihua Jinmao Tea Plantation (Zhejiang, China). Carbon dioxide (99%, purity) was purchased from Zhejiang gas Co., Ltd. (Zhejiang, China). Tertiary Butylhydroquinone (TBHQ), Butylated Hydroxyanisole (BHA), ethyl ether, and ethanol were analytically pure and supplied by Huadong Medicine Hangzhou Co., Ltd. (Zhejiang, China). DPPH and ascorbic acid were purchased from Sigma Chemical Co. (St. Louis, MO, USA). The other plant essential oils including geranium, peppermint, and clove were obtained from Hangzhou Liyuan Fragrance Technology Co., Ltd. (Zhejiang, China). The samples were stored at room temperature (about 27°C) under the dark condition. Prior to SFE, the samples were weighed with electronic balance (Mettler Toledo Co. Ltd., Shanghai,China ) and milled in a grinder (IKA-Werke GmbH & Co. KG) to produce powder which was passed through a 20-mesh sieve. The particle size was 0.8 mm. A supercritical fluid extractor Spe-edTM SFE2 (Applied Separation, USA) was used for all the extractions. The extraction vessel was a 50 mL thick-walled stainless cylindrical steel vessel (diameter: 2 cm, length: 33 cm). The prepared tea flower powder (15.0 g) was embedded into the extractor vessel with defatted cotton in the both ends. Then the extractions were carried out using different pressure, temperature, static and dynamic time as shown in Table 1. The flow rate of carbon dioxide was 2 L/min and the temperature of outvalve was 70°C. The extracts were collected in a volumetric flask at the ambient temperature and atmospheric pressure and their weights were measured. Finally, the extraction yield was calculated. The final volume of the extracts was diluted to 5 mL with ethyl ether and subjected to Gas Chromatography-Mass Spectrometry (GC-MS) analysis. On the basis of the single-factor experiment (Table 1), a four-factors (pressure, temperature, static extract time, and dynamic extract time) at three-level orthogonal array design was used to examine the effects of parameters on the extraction yield (Table 2). There were 9 runs in the design and all the experiments were conducted in triplicate. Table 1: Factors and levels of the single factor experiment. Table 2: Orthogonal factors for SFE of essential oil of tea flowers. GC-MS analysis of the essential oil was carried out using an Agilent HP-6890 GC (Agilent Technologies Co. Ltd., USA) equipped with a HP-5 quartz capillary column (30 m × 0.25 mm, 0.25 μm film thickness; Restek, Bellefonte, PA) and an Agilent HP-5973 (N) mass selective detector in the electronic impact mode (Ionization energy: 70 eV), as described by Cuevas-Glory, et al (2012) with a modification . Oven temperature was programmed to 50°C for 5 min and increased to 230°C at a rate of 3°C/min. Injector and the detector temperatures were set as 260°C and 280°C, respectively. The carrier gas, helium, was adjusted to a linear velocity of 1 mL/min. 1 μL of sample was injected into GC using a splitless mode. The DPPH radical scavenging activities of the essential oil of tea flowers was evaluated using the method reported by Lee and Yen (2006) . The DPPH radical was dissolved in ethanol with the final concentration of 0.1 mM. Firstly, the absorbance of the disposable cuvette with 2.7 mL DPPH radical solution and 0.3 mL ethanol was measured as negative control. Sample solution in ethanol (0.3 mL) with different concentrations was pipetted in a cuvette with 2.7 mL DPPH solution. Then the resultant solution was incubated for 30 min at 27°C in the dark and then monitored at 517 nm. The DPPH scavenging activity was expressed as following equation: S (%)=((AC(0) -AA(t))/AC(0)) ×100%. Where AC(0) is the absorbance of the negative control reaction, and AA(t) is the absorbance at 517 nm containing 0.3 mL sample and 2.7 mL DPPH solution. All samples were analyzed in triplicate. In this study, scavenging activity of the sample was expressed as a 50% scavenging concentration (SC50), which represented the sample concentration (mg/ mL) scavenging 50% of the DPPH radical activity. All experiments were performed in triplicate and all data was expressed as the mean ± standard error of the mean (S.E). Comparisons among the means of various treatments were analyzed through Duncan’s test. One way Analysis Of Variance (ANOVA) was used to determine the differences among means of treatments and the control. A probability level of 5% (p ≤ 0.05) was considered as significant level. The data were processed by using the SPSS statistical package (version 16.0). Relationship between the essential oil content and antioxidative activity was evaluated through correlation and regression by using the Microsoft Office Excel programme. Figure 1 shows the effect of temperature, static and dynamic time on the extraction yield. The extraction yield of the essential oil increased with the pressure increasing from 10 Mpa to 20 Mpa (Figure 1a), the temperature incresing from 40°C to 45°C (Figure 1b), the static time incresing from 10 min to 30 min (Figure 1c), and the dynamic time from 50 min to 70 min (Figure 1d), respectively. It tended to decline when the pressure increased to over 20 Mpa, the temperature over 45°C, the static time over 30 min, and the dynamic time over 70 min, respectively. 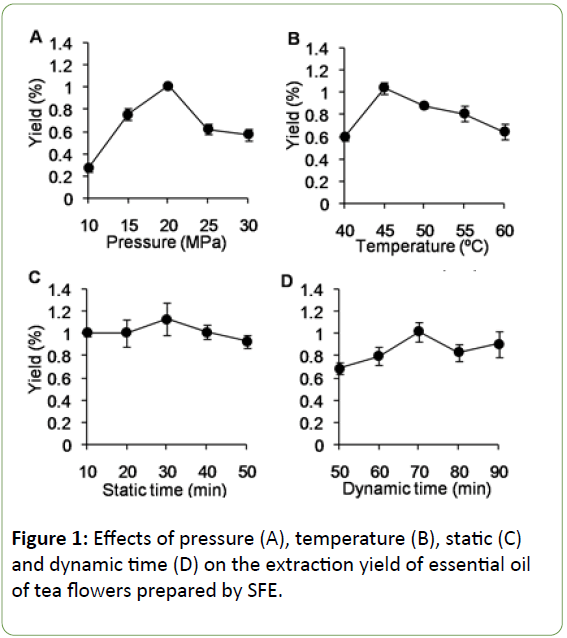 Figure 1: Effects of pressure (A), temperature (B), static (C) and dynamic time (D) on the extraction yield of essential oil of tea flowers prepared by SFE. The result of the four-factors (pressure, temperature, static extract time, and dynamic extract time) at three-level orthogonal array design indicated that the conditions to acquire the highest yield of the essential oil extracted with SFE was at 30 MPa of pressure, 50°C of temperature, 10 min of static time, and 90 min of dynamic time (Table 3). The order of primary and secondary factors affecting the extraction yield were the pressure, the static time, the dynamic time, and the temperature (Table 3). The ANOVA for the orthogonal array revealed that each selected parameter played an important role in the SFE of the essential oil of tea flowers and the influence was appeared to be significant (p<0.05) for all the analytes (Table 4). The F value indicated that the importance of the parameters influencing the extract yield was in order as pressure > static time > dynamic time>temperature (Table 4), which was in accordance with the results of orthogonal design (Table 3). Table 3: Orthogonal design for different conditions of SFE and their extraction yields. Table 4: AVONA of SFE of the essential oil of tea flowers. The 59 kinds of compounds identified by GC-MS contributed to 86.6% of the essential oil of tea flowers prepared by SFE (Figure 2). The main constituents were nonadecane (18.7%), heneicosane (12.2%), dibutyl phthalate (5.0%), tricosane (4.9%), 2-propenoic acid, 2-methyl-, 1, 1'-(1, 2-ethanediyl) ester (3.1%), 6, 10, 14-trimethyl-2-pentadecanone (3.0%), caffeine (1.7%), and phytol (1.6%) (Table 5). The identified compounds included 7 families of compounds including alkanes (45.4%), esters (10.5%), ketones (7.1%), aldehydes (3.7%), terpenes (3.7%), acids (2.1%), and ethers (1.3%) (Figure 3). Figure 2: Total ion current chromatogram(TIC) of the essential oil from tea flower. 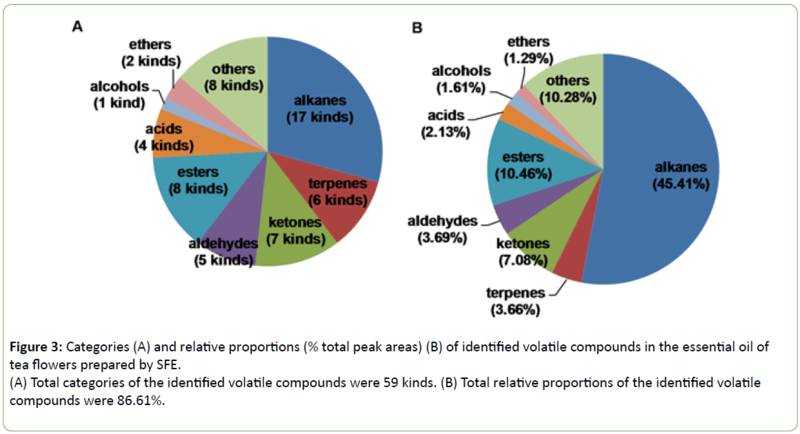 Figure 3: Categories (A) and relative proportions (% total peak areas) (B) of identified volatile compounds in the essential oil of tea flowers prepared by SFE. (A) Total categories of the identified volatile compounds were 59 kinds. (B) Total relative proportions of the identified volatile compounds were 86.61%. Table 5: Identified components of the essential oil of tea flowers prepared by SFE. a RT, retention time. b RP, relative proportions (% total peak areas). c Compounds listed in order of elution from HP-5 quartz capillary column. In view of potential application of the essential oil of tea flowers in food flavor and cosmetic industries, we evaluated its antioxidative activity using the DPPH radical system and also determined DPPH radical scavenging activities of essential oils of geranium, peppermint, clove, ascorbic acid, TBHQ, and BHA (Table 6). DPPH radical scavenging activity of the essential oil of tea flowers was assessed to be in a dose-dependent manner. Based on the SC50 value, the essential oil of tea flowers showed relatively stronger DPPH radical scavenging activity than essential oils of geranium and peppermint, and weaker than that of essential oil of clove, ascorbic acid, TBHQ, and BHA (Table 6). Table 6: DPPH radicals scavenging activity of the essential oils and compounds. Values are means of three determinations. The extraction yield increased with the pressure increasing from 10 Mpa to 20 Mpa and declined afterwards. This is due to that the increasing of carbon dioxide density reduces the distance between molecules, which means the analyte solubility of flower would be enhanced in carbon dioxide and the SFE system [25,26]. When the pressure continuously increased over 20 Mpa, the extraction yield decreased. This may result from the decreasing of diffusivity making it difficult for molecules to diffuse into the solid pores to dissolve the solute and the reduction of the free space owing to the condensation of the solid matrix . Therefore, excess pressure was not recommended because of its poor effect on the yield and the presence of unexpected complex extracts . The extraction yield increased with the temperature increasing from 40°C to 45°C, which most likely attributed to the strengthened mass transfer speed and the increase in vapor pressure of fluid bringing about the solubility of the essential oils in the solvent . When the temperature was over 45°C, the extraction yield decreased, which might be due to the decrease of the carbon dioxide density and the increase of the solute vapor pressure. On the other hand, for the volatile solute, there is a competition between its solubility in carbon dioxide and its volatility . Static time did not significantly influence the extraction yield, and relatively longer static time would lead to a little stoppage in the vessel thereby decrease of the extraction yield (Figure 1). The dynamic time is considered as another critical factor influencing the extraction yield. The maximum yield was obtained at the 70 min of dynamic time but even longer dynamic time did not significantly increase the extraction yield. In our previous experiments, the extraction yield of essential oil of tea flowers prepared by SDE was less than 0.1%, and alcohols such as acetophenone, 1-phenylethanol, and 2- pentanol were the major components . The extraction yield was 1.21% under the optimized condition in this test, indicating that SFE had much higher extraction yield of the essential oil and obtained more kinds of components in the essential oil. This implies that decomposition of some unstable volatile compounds may occur during the SDE process. In fact, decomposition and volatilization may take place during the drying process of fresh tea flowers, the extraction yield and component identification of the essential oil of fresh tea flowers extracted with SFE should be carried out in fure. The DPPH radical is a stable free radical widely used in the determination of the antioxidative activity of different plant extracts as well as single compounds . It is well-known that polyphenols, especially catechins, mostly contribute to the antioxidative activities of extracts of tea leaves, and volatile compounds can in part contribute to the antioxidative activities of tea leaves . In this study, the essential oil of tea flowers prepared by SFE contained diversity of volatile compounds and showed higher DPPH scavenging activity than those essential oils of geranium and peppermint, implying that it would be of interest to further test the bioactivity and identify the detailed volatile compound of the essential oils of tea flowers due to the large amout of the unutilized tea flowers. Under the optimized extraction condition (pressure of 30 MPa, temperature of 50°C, static time of 10 min, and dynamic time of 90 min). the extraction yield of the essential oil of tea flowers obtained with SFE was 1.21%, much higher than that of with SDE reported in our previous studies. Based on GC-MS analysis, up to 59 compounds including alkanes (45.4%), esters (10.5%), ketones (7.1%), aldehydes (3.7%), terpenes (3.7%), acids (2.1%), alcohols (1.6%), ethers (1.3%), and others (10.3%) were identified in the essential oil of tea flowers. The essential oil of tea flowers showed relatively stronger DPPH radical scavenging activity than those of geranium and peppermint, although it was weaker than those of essential oil of clove, ascorbic acid, tertiary butylhydroquinone, and butylated hydroxyanisole in this study. Which implyed that it would be of interest to further test the bioactivity and identify the detailed volatile compound of the essential oils of tea flowers due to the large amout of the unutilized tea flowers. Studies and reports on the essential oil of tea flowers are rare, and the research results of this test might provide essential information for application of tea flowers in health-care food and food flavor industries. CX performed most of experiments and statistical analysis and wrote part of the manuscript. YT supervised the work and wrote part of the manuscript. ZY supervised part of the work. YJ performed part of experiments. HX wrote most of the manuscript and supervised part of the work. All authors read and approved the final manuscript. All authors thank the research project supported by Zhejiang Province, China (Y201226032 and 2018C02012). Krafczyk N, Glomb MA (2008) Characterization of phenolic compounds in rooibos tea. J Agric Food Chem 56: 3368-3376. Dufresne CJ, Farnworth ER (2001) A review of latest research findings on the health promotion properties of tea. J Nutr Biochem 12: 404-421. Hamer M (2007) The beneficial effects of tea on immune function and inflammation: a review of evidence from in vitro, animal, and human research. Nutr Res 27: 373-379. Chen XP, Zhang WM, Shi JS, Gu GP (2007) Tea flowers' value in use and the comprehensive exploitation of the products. Mod Agri Technol (in Chinese) 3: 97-98. Lin YS, Wu SS, Lin JK (2003) Determination of tea polyphenols and caffeine in tea flowers (Camellia sinensis) and their hydroxyl radical scavenging and nitric oxide suppressing effects. J Agric Food Chem 51: 975-980. Yang ZY, Jie GL, He PM, Tu Y (2007) Study on the antioxidant activity of tea flowers (Camellia sinensis). Asia Pac J Clin Nutr 16:148-152. Yang ZY, Tu YY, Baldermann S, Dong F, Xu Y, et al. (2009) Isolation and identification of compounds from the ethanolic extract of flowers of the tea (Camellia sinensis) plant and their contribution to the antioxidant capacity. LWT-Food Sci Technol 42: 1439-1443. Wang YF, Yang ZW, Wei XL (2010) Sugar compositions, alpha-glucosidase inhibitory and amylase inhibitory activities of polysaccharides from leaves and flowers of Camellia sinensis obtained by different extraction methods. Int J Biol Macromol 47: 534-539. Wang L, Xu RJ, Hu B, Li W, Sun Y, et al. (2010) Analysis of free amino acids in Chinese teas and flower of tea plant by high performance liquid chromatography combined with solid-phase extraction. Food Chem 123: 1259-1266. Morikawa T, Miyake S, Miki Y, Ninomiya K, Yoshikawa M, et al. (2012) Quantitative analysis of acylated oleanane-type triterpene saponins, chakasaponins I-III and floratheasaponins A-F, in the flower buds of Camellia sinensis from different regional origins. J Nat Med 66: 608-613. Yoshikawa M, Morikawa T, Yamamoto K, Kato Y, Nagatomo A, et al. (2005) Floratheasaponins A-C, acylated oleanane-type triterpene oligoglycosides with anti-hyperlipidemic activities from flowers of the tea plant (Camellia sinensis). J Nat Prod 68: 1360-1365. Yoshikawa M, Nakamura S, Kato Y, Matsuhira K, Matsuda H (2007) Medicinal flowers. XIV. New acylated oleanane-type triterpene oligoglycosides with antiallergic activity from flower buds of Chinese tea plant (Camellia sinensis). Chem Pharm Bull 55: 598-605. Yang ZY, Dong F, Baldermann S, Murata A, Tu YY, et al. (2012) Isolation and identification of spermidine derivatives in tea (Camellia sinensis) flowers and their distribution in floral organs. J Sci Food Agric 92: 2128-2132. Dong F, Yang ZY, Baldermann S, Kajitani Y, Ota S, et al. (2012) Characterization of L-phenylalanine metabolism to acetophenone and 1-phenylethanol in the flowers of Camellia sinensis using stable isotope labeling. J Plant Physiol 169: 217-225. Han B, Zhou P, Cui L, Fu J (2007) Characterization of the key aromatic constituents in tea flowers of elite Chinese tea cultivars. Int J Tea Sci 6: 31-36. Joshi R, Poonam, Gulati A (2011) Biochemical attributes of teaflowers (Camellia sinensis) at different developmental stages in the Kangra region of India. Sci Hortic 130: 266-274. Joshi R, Poonam, Saini R, Guleria S, Babu GD, et al. (2011) Characterization of volatile components of tea flowers (Camellia sinensis) growing in Kangra by GC/MS. Nat Prod Commun 6: 1155-1158. Kawakami M, Ganguly SN, Banerjee J, Kobayashi A (1995) Aroma composition of oolong tea and black tea by brewed extraction method and characterizing compounds of Darjeeling tea aroma. J Agric Food Chem 43: 200-207. Kawakami M (1997) Modern Methods of Plant Analysis: Comparison of extraction techniques for characterizing tea aroma and analysis of tea by GC-FTIR-MS. Springer 19: 211-229. Papamichail I, Louli V (2000) Magoulas K. Supercritical fluid extraction of celery seed oil. J Supercrit Fluid 18: 213-226. Cao XL, Tian Y, Zhang TY, Ito Y (2000) Supercritical fluid extraction of catechins from Cratoxylum prunifolium Dyer and subsequent purification by high-speed counter-current chromatography. J Chromatogr A 898: 75-81. Yamini Y, Khajeh M, Ghasemi E, Mirza M, Javidnia K (2007) Comparison of essential oil compositions of Salvia mirzayanii obtained by supercritical carbon dioxide extraction and hydro distillation methods. Food Chem 108: 341-346. Cuevas-Glory L, Ortiz-Vázquez E, Pino JA, Sauri-Duch E (2012) Floral classification of Yucatan Peninsula honeys by PCA & HS-SPME/GC–MS of volatile compounds. Int J Food Sci Tech 47: 1378-1383. Lee CP, Yen G (2006) Antioxidant activity and bioactive compounds of tea seed (Camellia oleifera Abel.) oil. J Agric Food Chem 54: 779-784. Bocevska M, Sovova H (2007) Supercritical CO2 extraction of essential oil from yarrow. J Supercrit Fluid 40: 360-367. Herrero M, Mendiola JA, Cifuentes A, Ibanez E (2010) Supercritical fluid extraction: Recent advances and applications. J Chromatogr A 1217: 2495-2511. Zermane A, Meniai AH, Barth D (2010) Supercritical CO2 extraction of essential oil from Algerian Rosemary (Rosmarinus officinalis L.). Chem Eng Technol 33: 489-498. Pourmortazavi SM, Hajimirsadeghi SS (2007) Supercritical fluid extraction in plant essential and volatile oil analysis. J Chromatogr A 1163: 2-24. Li B, Xu Y, Jin YX, Wu YY, Tu YY (2010) Response surface optimization of supercritical fluid extraction of kaempferol glycosides from tea seed cake. Ind Crop Prod 32: 123-128. Khajeh M, Yamini Y, Shariati S (2010) Comparison of essential oils compositions of Nepeta persica obtained by supercritical carbon dioxide extraction and steam distillation methods. Food Bioprod Process 88: 227-232. Brandwilliams W, Cuvelier ME, Berset C (1995) Use of a free-radical method to evaluate antioxidant activity. LWT-Food Sci Technol 28: 25-30. Yanagimoto K, Ochi H, Lee KG, Shibamoto T (2003) Antioxidative activities of volatile extracts from green tea, oolong tea, and black tea. J Agric Food Chem 51: 7396-7401.